The building which will next year act as the non-accredited media centre for the Olympic Games has an interesting history. Originally constructed between 1910 and 1913 for the Institution of Civil Engineers - who still remain in the building today - its position at the heart of Westminster life has led it to bear witness to a number of interesting events. 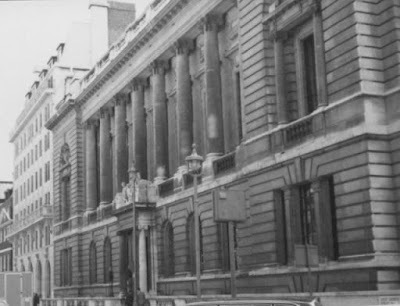 Most famously, it was at One Great George Street that the charter which established UNESCO was signed in 1945, but it was also here that Labour held manifesto launches in the lead up to its election win in 1997. The building also acted as a venue for the presentation of the Butler Report into the intelligence used to justify the Iraq War gave its findings in 2004 and, thanks to the Film London Partnership, it has also had a career as a film star, with crews from productions such as Ghandi, In The Loop and Bridget Jones - Edge of Reason using it as a location for shoots. But the building is also important as part of the day to day churn of the Westminster news cycle. As a press conference venue, for example, it was here that Michael Schumacher and Road Safety Minister Stephen Ladyman MP came together for a Rally for Safer Roads in 2007, which probably held the headlines for about thirty seconds, and it is downstairs at the Brasserie One restaurant that journalists meet top politicians and their spinners for lunchtime briefings to grease the wheels of the media machine. I've been to meetings in this building many times but didn't know about all the other things that had happened there. Thanks for the interesting post. Constructed for and still the headquarters of the Institution of Civil Engineers.